Companies are required to follow environmental regulations at the local, state and federal levels to dispose of hazardous waste safely. Solvent distillation offers a way for companies to do so, but gain back lost raw materials as well. Distillation is the most cost-effective and environmentally-friendly method for processing spent solvent bearing hazardous waste. Unlike typical fuel blending, purified solvents are returned to industry to continue the life of the product - reducing and reusing hazardous waste. Here’s how. Solvents are molecules that are able to dissolve other molecules known as solutes. A solvent can be in the form of a solid, liquid or gas. The molecules of a solvent work to pull apart the solute molecules. Eventually during this process, the solute molecules become evenly distributed throughout the solvent. This even, homogeneous mixture cannot be separated physically. It instead takes heat or another chemical process to separate the solvent and solute. In science, a solution consists of a solvent and a solute. By definition, solvents have a higher concentration than solutes. One of the most widely used solvents is water. Other organic compounds, such as tetrachloroethylene, turpentine or acetone, also are well known. Solvent distillation occurs when a liquid or vapor mixture of two or more substances is separated into its component fractions of desired purity. This is done through the application and removal of heat. Solvent Distillation Recovery is based on the fact that the vapor of a boiling mixture will be richer in low boil point components. When the vapor of the boiling mixture is cooled and condensed, the liquid condensate can be sold back to industry. The higher boiling point portion of the original mixture that does not vaporize remains in the bottom of the recovery still. This portion is valuable as a fuel source for certain industries. When hazardous waste is received at a solvent distillation facility, liquids are filtered and blended in a blending tank. They are then directed to a solvent recovery still. At Temarry Recycling, solid wastes are thermally treated at 1,500 degrees F to generate steam. This steam is then used to power the recovery stills. You can read more about this energy recovery process that provides the steam to power the recovery stills in our article, Solvent Distillation and the Energy Recovery Process Explained. Waste solvents are received and sorted. They also go through a fingerprint analysis. After filtering takes place, solvents are pumped to the distillation unit. The heat exchanger then cools off the solvent. After it is cooled, the solvent is directed to a finished product tank. The product is then packaged into drums and totes for distribution back into industry. Solvent distillation is an important process that reduces that amount of hazardous waste disposed of in the environment. 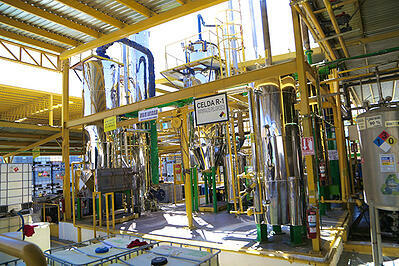 By continuing the life of the product, solvent distillation ensures waste once again becomes valuable. It also reduces a company’s carbon footprint when hazardous waste solids are converted to energy and then used to power solvent recovery stills. Solvent distillation further prevents more waste from being generated in the form of pollution. Waste transportation is one of the most impactful activities when calculating a company’s carbon footprint. The number of truck loads that use diesel fuel to transport materials off site for secondary recycling at a cement kiln are reduced dramatically with the use of solvent distillation. Solvent distillation also further reduces hazardous waste when part of a True Closed Loop Recycling system. This system includes an energy recovery process from waste solids, and the solvent distillation process from waste solvents. With a Closed Loop Recycling system, virtually nothing is wasted. For each 100 gallons of solvents distilled, 30 gallons of still bottoms are generated to be blended with ash. This process ensures all waste is recycled and kept out of the landfill. This also ensures a company meets all local, state and federal regulations, while eliminating waste streams and helping preserve the environment.